Having grown up in South Florida, Callie M. Chavoustie, M.S., MFT has a deep understanding of the community and culture. 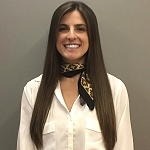 Her Hispanic background and bilingual (English/Spanish) capability has provided her with the opportunity to work with a diverse population, while enhancing her sensitivity to multicultural issues. Callie received her Bachelor’s degree from the University of Miami in Psychology with a minor in Women and Gender Studies in 2012. While completing her Bachelor’s, Callie served as a student liaison for the Body Awareness Resource & Education Group through the University of Miami Counseling Center. As a part of this group, she helped to promote healthy body image and awareness to other students at the University. During this time Callie’s passion for eating disorder awareness and treatment was cultivated, which influenced her desire to specialize in this field. During her college years, Callie gained a deep knowledge of the LGBTQ community through multiple courses. This aided in her ability to empathize with, understand, and contribute to feelings of safety for patients in those populations. Additionally, she worked as a research assistant for the Head Start organization intervening with children from low socio-economic status backgrounds. Callie received her Master’s degree in Marriage and Family Therapy in 2014. During her studies, she completed her internship at an outpatient psychiatric facility working with a wide variety of individuals and mental disorders. She incorporates her Cognitive-Behavioral Therapy (CBT) as well as Acceptance and Commitment Therapy (ACT) experience with a variety of other therapeutic approaches to help clients learn healthy and effective coping mechanisms. In addition, Callie worked at the Oliver-Pyatt Centers, a residential eating disorder treatment center for women and adolescents struggling with anorexia, bulimia, binge eating disorder and orthorexia. She is incredibly passionate about aiding clients with eating disorders as they navigate learning to practice self-love and mindful and intuitive eating. Callie can be reached at the main number or by email at callie@miamicounseling.com.